2015 will likely end up being The Year of Star Wars. The Force Awakens is all but guaranteed to destroy box office records, but while it’s been over 10 years since the last Star Wars film was released, it’s also been just as long for a proper Battlefront game. 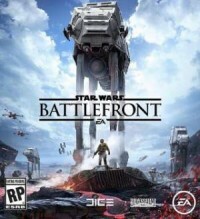 November will see the release of 2015’s Battlefront and we got our hands on a demo at San Diego Comic-Con (SDCC). 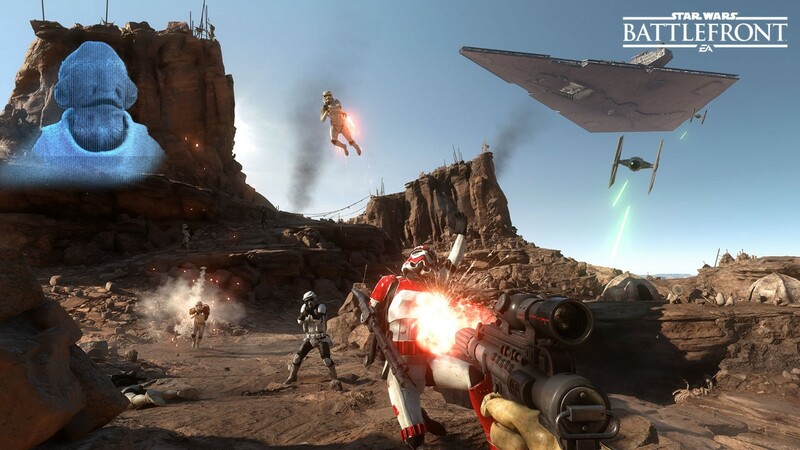 The demo took us through a Tatooine map that focused on co-op gameplay. We played as Rebel soldiers to face numerous waves of Imperial forces, primarily grounded-Stormtroopers but occasionally with an AT-ST walker thrown into the mix (at least as far as we made it). The first wave was a simple kill-fest, but soon after we were required to secure escape pods before the Empire. For the demo being in an Alpha stage, it played very well and looked great. The UI layout was modern, but didn’t seem out of the realm of a “Star Wars feel.” We were given several loadout options, and I went with a protective bubble shield and a small rocket launcher option. The former won’t allow you to shoot from the inside, so it must be used primarily to buy a few seconds to find a good spot to boost away from. My rocket launcher worked well against the AT-ST walkers, but even blasters would inflict some damage upon the so-called chicken walkers. None of the features felt overpowering or too underwhelming. It played in a balanced way that DICE is known for. The waves of enemies were an interesting challenge. Only the occasional Stormtrooper would break off onto its own; for the most part, they hunted us down in packs to flank and unleash a bigger barrage of blaster fire. It was never overly difficult, though jetpack Stormtroopers typically were ones that got the jump on us due to natural height advantages. The groups moved intelligently, but never so much so that they didn’t feel like the dumb Stormtroopers portrayed in the films. EA and DICE likely have a hit on their hands with the way the game already handles. See Star Wars Battlefront on store shelves November 17 and keep it locked on SmashPad for all of our 2015 SDCC coverage!